During our wedding we had our wedding guest book. Wedding guess book plays a very important role during your wedding day. I choose the design and I just added some more decoration that fits to our wedding motif. It was very simple and it was color green. It matches to our motif. All guest and sponsors must write their names and you can also require them to write a wish for the couples. This is a very good remembrance on your wedding day! What we did, all guest and sponsors wrote their wishes to us! 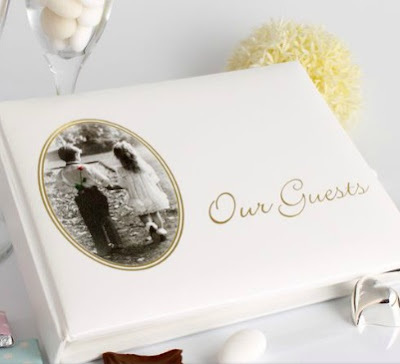 If you are looking for a wedding guest book find the best one that you like. Find simple yet elegant and of course you couple must agree which one you most prefer! There are lots of wedding guest book designs online that you can order directly. Place your order ahead of time to avoid panic and prepare all things needed on your wedding day! Make sure to be prepared. Get a wedding planner to help you plan all the way! Don't forget to choose the best guest book. This book will be yours forever and you can read all wishes and remember all guests during your day by just opening your guest book year after years. There are online pages that offers customize designs according to your likes, so the only thing is to search and you will find. Make a lot of surfing if you want to have the best on your big day! It is worth and exciting. This entry was posted on 11:41 AM and is filed under affordable guest book , wedding guest book , Wfashion . You can follow any responses to this entry through the RSS 2.0 feed. You can leave a response, or trackback from your own site.